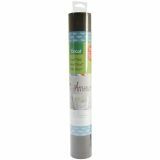 Cricut Vinyl 12"X48" Roll - PROVO CRAFT-Cricut Vinyl. This vinyl is perfect to use for a variety of craft and home decor projects! This package contains one 12x48 inch roll of vinyl. For use with Cricut machines. Available in a variety of designs, each sold separately. Imported.